From the stars to our bodies, heat is everywhere. As long as atoms continue to move around, heat energy is generated and transferred via conduction, convection, or radiation. Heat energy transferred as an electromagnetic wave, similar to light, is known as thermal radiation, and while we can feel heat, we cannot see it. Infrared cameras, also known as thermographic cameras, differ from cameras that capture images within the visible spectrum. In fact, infrared cameras can only capture images of objects that omit radiation in the infrared region, which can be well beyond our visible threshold of 650 nm. Both thermal and infrared imaging allow us to “see” heat. So what is the difference between thermal and infrared? What we refer to as infrared is typically in the range of near infrared (NIR). NIR is the closest to our visible range, which radiates electromagnetic wavelengths of 650-1050 nm; whereas long-wave infrared (LWIR) ranges from 8000-12000 nm. While both bands of light can detect heat, a LWIR-sensitive sensor is able to detect heat as well as contrasting levels of heat between different objects – this is what is referred to as thermal imaging. In between these bands of the spectrum is short-wave infrared (SWIR). SWIR is just beyond NIR with wavelengths of 1050-2500 nm, and is popularly used for moisture detection. Imagine taking a picture of two identical mugs; one is holding warm water, the other holds cold water. You would not be able to tell the difference between the two without touching them both. With an infrared camera, you will see the contrast between what’s inside of the mug and its surrounding environment. The infrared sensors inside the camera can detect the different levels of thermal radiation in the water and its distribution through the ceramic of the mug, which can be used to produce an image that shows a mosaic of different temperatures. Initially used by the military, thermal imaging has been adapted for various applications. From our homes to outer space, infrared and thermal imaging are used to analyze different levels of light and heat to better manage and understand our surroundings. Energy consumption has a direct relationship with greenhouse gas emissions. It’s become clear that if we manage our energy use, we can lower our gas emissions. According to Eurostat, European households account for 25%-27% of all of energy consumption in Europe. Additionally, US household emissions account for 4% of global carbon emissions. Heating systems are costly for both the wallet and for the environment. Regular HVAC system inspections can provide necessary feedback to tell homeowners and businesses whether their buildings are energy efficient. About 70% of the heat produced by a boiler can escape through the roof, walls, windows, and doors because of cracks or lack of insulation. These areas need to be identified in order to prevent heat or air conditioning can escape. HVAC professionals utilize thermal imaging to analyze spots where heat or air conditioning can leak out, such as faulty windows or cracks that need to be filled in – helping save time, money, and energy. Thermal imaging inspection during the winter months can help pinpoint areas of heat loss, whereas summer is the perfect time to find areas of heat gain. Businesses can also save a lot of money by ensuring their buildings are energy efficient. Small businesses in the US spend more than $60 billion a year on energy. 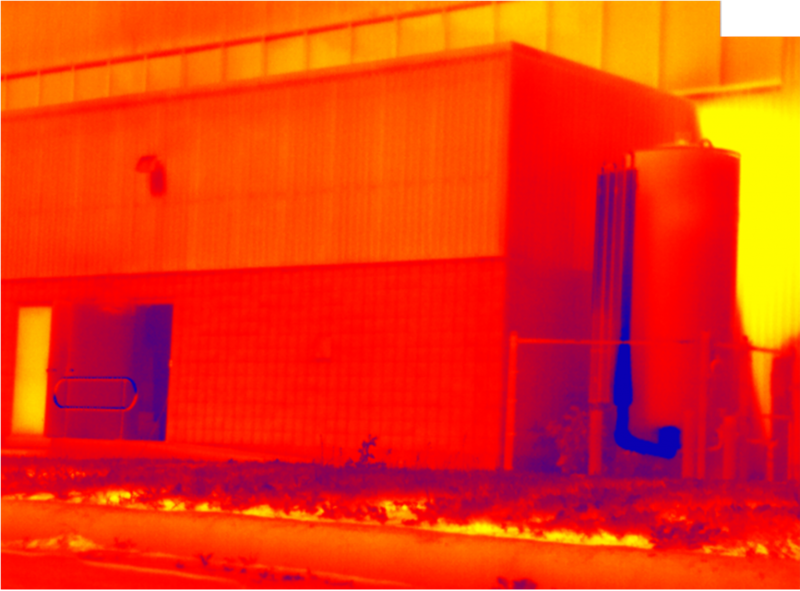 Infrared imaging can map out areas of energy loss, especially with larger structures. An image of a building during the summer. The blue indicates cold, where air conditioning is escaping through the door, and which pipes contain cold fluids. In cases of fire, the use of thermal imaging might sound counterintuitive since heat would be surrounding the entire area; however, thermal imaging cameras are capable of detecting differences in heat. Depending on how the camera is designed, thermal imaging cameras can detect differences as small as 0.01°C. Firefighters often have a hard time navigating their way through a smoke-filled building. However, thermal cameras can help firefighters see through thick walls of smoke that would otherwise obstruct their view. It also enables them to detect burning surfaces and help distinguish a human amidst the heavy smoke and flames. Furthermore, infrared imaging can help first-responders map out the fire and help aid with navigation. Drones can be equipped with thermal imaging cameras and airborne sensors to fly over dangerous areas, which responders cannot access. With this technology, emergency personnel have the ability to determine the size of the fire, the rate it’s spreading, and to identify civilians that require rescue, as well as detect other hazards present during fire suppression. Thermal imaging can also ensure that all of the flames have been extinguished – the failure to extinguish smaller flames is a dangerous problem. Infrared imaging also allows researchers to discover and observe celestial bodies both within and beyond our solar system. 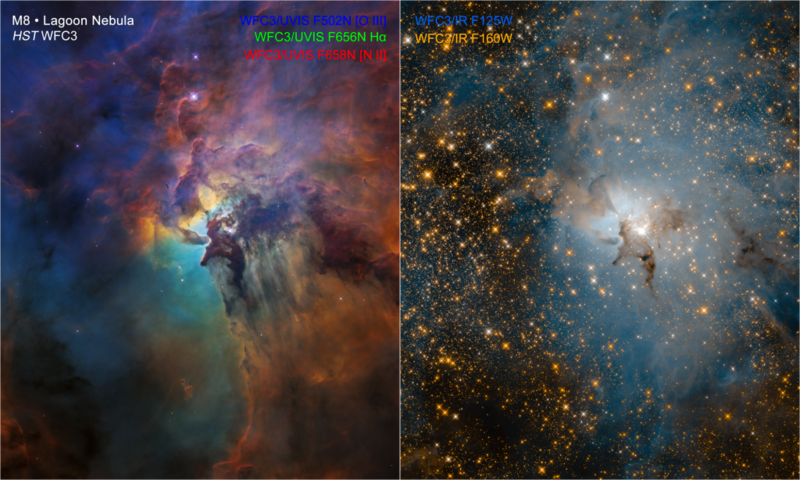 Planets, stars, galaxies, and other celestial objects radiate energy in the infrared spectrum, enabling scientists to capture images that would otherwise be obstructed by dust particles – a branch of astronomy known as infrared astronomy. Additionally, there are only certain “windows” in the Earth’s atmosphere where infrared radiation can reach telescopes, due to water vapors absorbing infrared radiation. To overcome this atmospheric obstacle, space-based telescopes were developed. Space-based telescopes took off in the 1960s, and have since enabled astronomers to discover new planets and stars outside of our solar system. They are also capable of conducting weather analysis when pointed toward Earth. Launched in the 1990s and equipped with Teledyne Imaging’s high sensitivity near-infrared sensors, the Hubble space telescope has made several astounding discoveries, from new planets to dark matter. The Hubble has also been used in the possible discovery of the first Exomoon, where researchers observed changes in the NIR exposure of the moon. From new galaxies to new molecules, advancements in imaging technology allow humanity to discover new aspects of our earth, and the universe. With thermal imaging, we are able to “see” what, in the past, was unseen. And in so doing, improve our understanding of not only our impact on our environment, but our response to environmental change. Being able to see beyond the visible spectrum improves the accuracy of inspection systems, enables the discovery of astronomical objects, and gives us the insight we need to manage natural disasters.